^ "US Board on Geographic Names". United States Geological Survey. August 5, 2003. Retrieved October 22, 2018. ^ "Ancestry Map of African-American Communities". Epodunk.com. Retrieved January 3, 2015. ^ "Ancestry Map of Bahamian Communities". Epodunk.com. Retrieved January 3, 2015. ^ a b "Ancestry Map of British West Indian Communities". Epodunk.com. Retrieved January 3, 2015. ^ "Ancestry Map of Cuban Communities". Epodunk.com. Retrieved January 3, 2015. ^ "Ancestry Map of Jamaican Communities". Epodunk.com. Retrieved January 3, 2015. ^ "Ancestry Map of Dominican Communities". Epodunk.com. Retrieved January 3, 2015. ^ "Ancestry Map of Haitian Communities". Epodunk.com. Retrieved January 3, 2015. ^ "Ancestry Map of Nicaraguan Communities". Epodunk.com. Retrieved January 3, 2015. ^ "Ancestry Map of Colombian Communities". Epodunk.com. Retrieved January 3, 2015. ^ "MLA Data Center Results for Andover, Florida". Modern Language Association. Retrieved January 3, 2015. ^ "MLA Data Center Results of Bunche Park, Florida". Modern Language Association. Retrieved January 3, 2015. ^ "MLA Data Center Results of Carol City, Florida". Modern Language Association. Retrieved January 3, 2015. ^ "MLA Data Center Results for Lake Lucerne, Florida". Modern Language Association. Retrieved January 3, 2015. 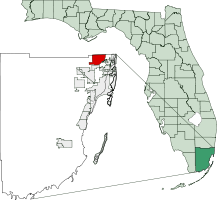 ^ "MLA Data Center Results for Norland, Florida". Modern Language Association. Retrieved January 3, 2015. ^ "MLA Data Center Results for Opa-locka North, Florida". Modern Language Association. Retrieved January 3, 2015. ^ "MLA Data Center Results for Scott Lake, Florida". Modern Language Association. Retrieved January 3, 2015. This page was last edited on 14 April 2019, at 01:55 (UTC).